The owner of Release Physical Therapy, Dr. Cari Simon received her Doctorate degree in Physical Therapy from the University of Hartford. A former All-New England and All-State soccer player, she was part of the U.S. Women’s Soccer National Team pool, but ultimately decided to redirect her career in pursuit of her true passion: care. 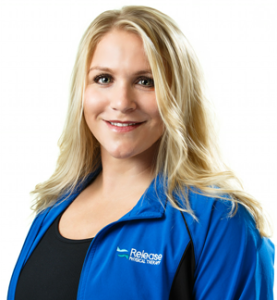 She is now one of the top physical therapists in Washington, DC. As one of the most highly regarded physical therapists in Washington, DC, Dr. Cari Simon’s treatment approach combines manual mobilization and manipulation techniques with individualized therapeutic exercise. She is a full body Active Release Technique (ART) provider. Additionally, Dr. Simon utilizes McConnell, athletic, and Kinesio Taping methods, as well as Trigger Point Dry Needle Therapy. When she is not helping her patients meet their physical goals, Dr. Simon enjoys networking with other physical therapists in Washington, DC, outdoor activities and spending time with her family. Schedule an appointment with Physical Therapist Dr. Cari Simon. Dr. Clare received her Doctorate of Physical Therapy at the prestigious Northwestern University Feinberg School of Medicine and her Bachelor of Science in Kinesiology from Indiana University. She is experienced in injury prevention and rehabilitation, performance enhancement, functional movement, and manual therapy. She also maintains a certification in Trigger Point Dry Needling. In addition, Dr. Clare has a deep and valuable perspective in the fields of nutrition and wellness, which she integrates into her practice. She takes a holistic approach to patient care, helping patients reach their optimum health. Dr. Clare is committed to Release’s core mission: to provide the best in individualized treatment in the greater Washington area, with an attention to diverse client needs. She has extensive experience in all outpatient orthopedic conditions with a keen interest in treating high-performance athletes. Dr. Clare lives in Washington, DC, and is an athlete herself. She enjoys snow-boarding, hiking, camping, and competing in Tough Mudder events. 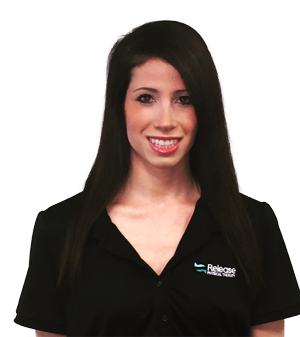 Schedule an appointment with Physical Therapist Dr. Danielle Clare. 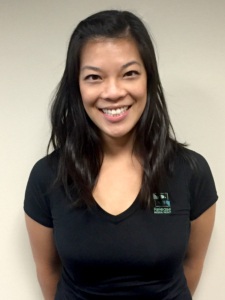 Dr. Stephanie Lam, DPT, CMTPT is the newest addition to Release Physical Therapy. Dr. Lam received her Doctorate of Physical Therapy from the School of Health Technology and Management at Stony Brook University, after attaining dual degrees in Biology and Psychology from the University of Virginia. She is highly experienced in several fields of adult orthopedics, including post-surgical recovery, acute sports injury rehabilitation, athletic performance improvement, and chronic pain management. She also has a passion for pediatrics and has treated kids of all ages for congenital and developmental issues. In fact, Dr. Lam redirected her thoughts about medical school to pursue physical therapy after completing an internship in pediatric Aquatic Therapy. Dr. Lam uses her patient’s individual goals to guide treatment, addressing her patient’s symptomatic impairments while considering their day-to-day ability to function and perform athletic and recreational activities. Dr. Lam incorporates manual therapy throughout her treatments, specializing in extensive deep soft tissue manipulation and mobilizations of the spine and peripheral joints. She is also certified in Dry Needling for Trigger Point Release. In her free time, Dr. Lam enjoys being active and is always welcome to suggestions for new adventures around DC and Virginia. She loves hiking with her dog, hosting dinner parties, and reading.